There are currently 229 people online. Xigmatek is perhaps best known for its coolers but the Taiwanese company also has a line of cases. In this review I'm taking a look at the Pantheon, an all-black mid-tower designed for computer enthusiasts. Xigmatek has made a habit of naming products after names from mythology and this case's name refers to the Pantheon of Rome, a temple dedicated to all Roman gods. The Pantheon we know today was built in 126 AD by Emperor Hadrian and with a diameter of 43.4m it had the largest dome in the world until 1436. Since the 7th century, the temple has been converted into a Roman Catholic Church and to this day it's still used for masses. Wikipedia mentions the Pantheon is used on important Catholic days as well as for wedding ceremonies. Enough with the history lesson, lets take a look at how Xigmatek's new case performs. The mid-tower ships in a cardboard box with Pantheon theming, with the dome taking up a prominent position. 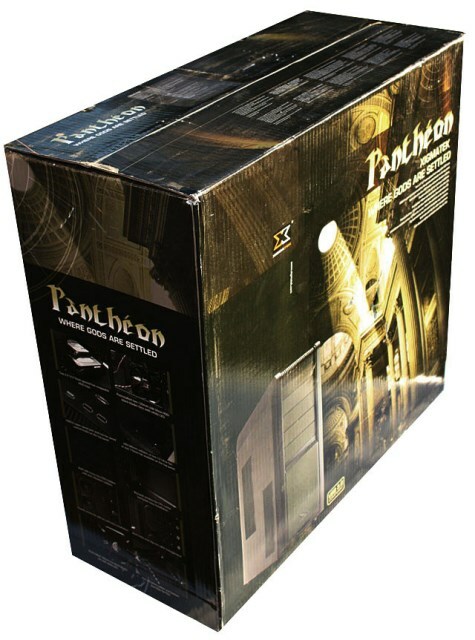 Xigmatek says in its case description that just like the ancient temple, the Pantheon case is big and impressive by a great architecture and dedicated engineering for all your hardware. The case ships in four variants, an all-black model and an all-black model with a silver trim. Both models are available with or without sidewindow. The subject of this review is the Black/Silver version without sidewindow. 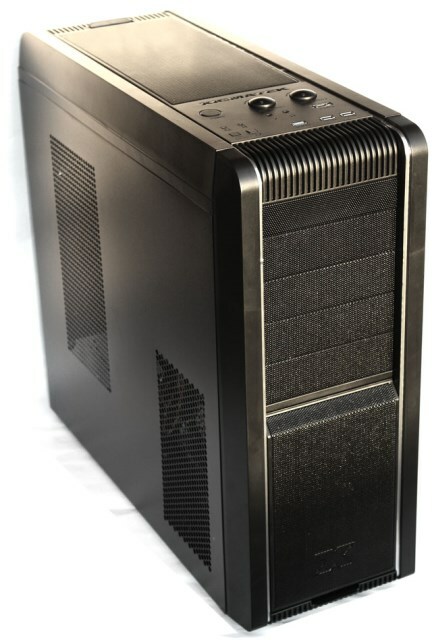 The design of the Pantheon reminds me a little of the Cooler Master CM 690 II Advanced, the case has a matte all-black design and looks pretty beautiful. The front has a meshed design and the left and right sides feature a silver-colored strip. The silver trim in the version I received consists is basically a sticker but I'm told the strip in the retail versions will be a metal inlay, thus looking much nicer than what you see in the pictures below. The design of the case is quite open, two relatively large vents are found in the left side panel, one in the HDD area and one in the CPU/GPU area. The case measures 206mm x 543mm x 500mm (W x H x D) and weighs just 8.5kg. Drive Bay External x 4 with both side tool-free holders with anti-vibration rubbers. Expansion Slot 7 slots(Thumb screws), 300mm free length for long card. 1. Intake airflow hole with dust filter. 2. Available for face upward and downward installation. Top Fan: Optional 120/140mm fan x 2 or 170mm fan*1. Fan Speed Control: Six fan speeds are adjustable synchronously by two knobs on top panel. Available for 240/280mm radiator on the top. I/O Panel Top Panel: Power switch, Reset switch, USB3.0*1, USB2.0 x 2, e-SATA x 1, Audio in/out x 1 (HD Audio), two knobs of fan controller.